Chemistry professor Catherine Murphy, seated at the microscope, explains the work of her research team to Peggy Flavin, an environmental design student. Chemistry students building nanomaterials in chemistry professor Catherine Murphy’s lab are sharing space at their workbenches this spring with an aspiring architect, an environmental design student and two dancers. The four undergraduate students from the College of Fine and Applied Arts won’t be running experiments, but they’ll spend time with the chemistry researchers, observing and asking questions about their work. They’ll take what they learn and use it to develop projects in their own areas of study. Murphy created the Murphy Lab Participant/Observer Program – a partnership with the College of Fine and Applied Arts – after coming to the U. of I. in 2009. She had been involved in a similar program that brought arts students into science labs at the University of South Carolina. “It was really fun for the science and arts students involved. Everybody got something out of it,” Murphy said. “I want my students to get better at communicating science to people who aren’t scientists, and I want people who aren’t scientists to better understand science,” she said. Each fall, FAA has a competition for students interested in the program. The students must write an essay about their interest and provide a portfolio of their work. Murphy and Michele Plante, the coordinator of career services for FAA, review the applications and select the students for the spring program. Peggy Flavin, one of the lab’s participant/ observers this spring, is a junior from Downers Grove, Illinois, majoring in environmental design – an interdisciplinary major she created to satisfy her interests in sustainable design and public policy. “As an interdisciplinary major, I’m interested in the overlap of fields,” she said of her interest in the participant/observer lab. Flavin works at the Research Park’s incubator facility, home to many biotech companies, and she was interested in becoming more involved with science and chemistry. Doing so expands the potential subject matter of her artwork. “There’s a whole wealth of other things going on to explore,” she said. Leah Guadagnoli, who graduated in 2012 with degrees in painting and art history, participated in the program twice while at the U. of I. “Working with the lab really helped shape me as an artist significantly,” said Guadagnoli, who lives in Brooklyn, New York, and is represented by 247365, a New York City gallery where she had a solo show this winter. The lab’s participant/observer program exposed her to people other than undergraduates and who were working in different fields. The Murphy research group has developed procedures to make gold nanoparticles of controlled size and shape on the nanoscale. The size and shape of gold nanoparticles, in turn, control what wavelengths of light they absorb and scatter. 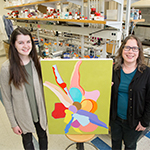 Murphy and her team look at the nanoparticles’ potential uses for biological applications, such as imaging cells, as well as the environmental impact of the nanoparticles and their chemical interactions with their surroundings. Guadagnoli became fascinated with the images the chemistry students were looking at under their microscopes. Guadagnoli made sketches from photographs of the forms on the slides, combined them and made paintings of the shapes against a gold-colored background. Murphy has one of Guadagnoli’s paintings in her lab. 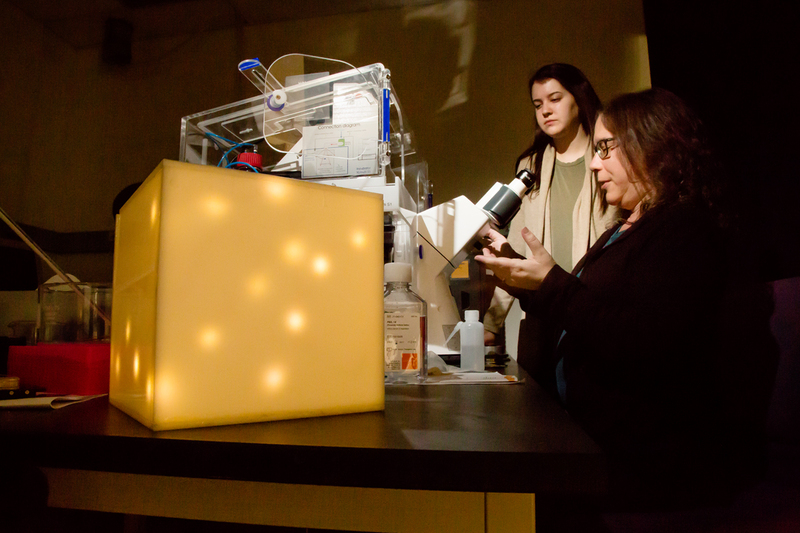 Other students have created jewelry inspired by the particles being developed in the lab; a musical composition; a 3-D collage; and a light box, made by an architecture student, with lights that resemble how the particles look when seen under a microscope. A studio art major took images from the electron microscopy done in the lab and made an array of the images encased in gold boxes. Murphy has them hanging on her dining room wall in her home. This is the first year in which dance students have participated in the program, so Murphy is eager to see what they will produce from their semester in the lab. There is actually a lot of common ground between the activities of the scientists and the artists, Murphy said. She noted that gold nanoparticle solutions are vividly colored. Even though they didn’t understand nanotechnology, medieval artists used gold and silver nanoparticles in stained glass to give the glass a rich color that wouldn’t fade. The gold produced a deep red and the silver a vivid yellow. “There’s a long history of art leading science,” Murphy said.